A well prioritized project is a project that is performed with the best use of available resources such as time, people, funds, etc. Read this Project Prioritization Checklist to find out how to best use your project resources and reach higher effectiveness. 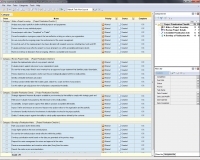 Analyze your project portfolio to define individual projects and programmes. Review status of every individual project. Discard projects with status "Completed" or "Failed". Discard incomplete or in-progress projects that are ineffective or bring no value in your organization. Be sure every effective ongoing project has endorsement of the senior management. Ensure that each of the ongoing projects has been allocated with required resources, including time, funds and HR. Evaluate performance per effective project to ensure all projects run within acceptable performance levels. Make an inventory of all projects that are ongoing, effective, acceptable and resourced. Analyze the implementation plan of every project selected. Evaluate projects against relevance to your organization’s goals. Be sure that every project listed in your inventory has an approved scope statement that identifies project boundaries, requirements and deliverables. Review objectives of your projects and be sure they are strategically aligned with the overall portfolio. Identify scheduled timeframes per project. Develop a project details table that includes goals, objectives, scope and time of your projects. Use this table to get a big picture view of all projects compared by the details. Strategic alignment. Measure all projects available in your inventory by their ability to comply with strategic goals and objectives of your company. Relevance. Evaluate every project by the relevance to the overall portfolio. Acceptability. Compare projects against their ability to produce acceptable deliverables. Impact. Define and measure an amount of impact every project makes to the organization and the portfolio. Involvement. Identify the level of involvement of stakeholders involved in the project portfolio. Quality. Evaluate projects against their ability to satisfy quality expectations defined by the customer. Rank your projects by the listed criteria. Assign higher priority to the most ranked projects. Be sure that low-ranked projects remain effective within the portfolio. 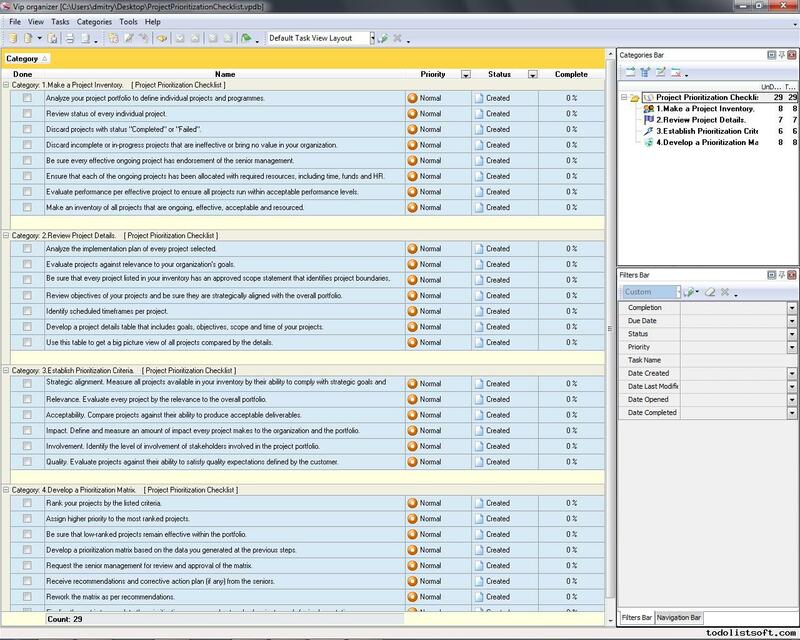 Develop a prioritization matrix based on the data you generated at the previous steps. Request the senior management for review and approval of the matrix.